Dream team: Kerber and Fissette. Angelique Kerber‘s coach Wim Fissette believes we haven’t seen the best of his charge yet after she picked up a third Grand Slam crown and first at Wimbledon on Saturday. Fissette teamed up with Kerber at the end of a woeful last season for the German and together, they’ve turned things around dramatically in 2018. The Belgian coach, who has worked with a long list of top players like Simona Halep, Johanna Konta, Kim Clijsters and Victoria Azarenka, has been a key part in Kerber’s return to form this season. Kerber, who reached No. 1 in the world in 2016 after winning two Grand Slams in Melbourne and New York, dropped outside the top-20 in 2017. But within less than seven months, she has risen from No. 22 at the start of the year, to No. 4 when the new rankings are released on Monday. “I’d say she’s more confident right now and I feel she knows herself a bit better. What she needs to play her best tennis, what she needs to feel well throughout the tournament, when to take a little bit more rest and I feel like – maybe because she’s 30 as well since January so maybe that also helped her but I feel she changed a bit yes,” said Fissette after Kerber’s 6-3, 6-3 win over Serena Williams on Saturday. The 30-year-old Kerber is now 3-1 in Grand Slam finals, and she brought her A-game in all four, even the one she lost to Williams at the All England Club in 2016. She is a big-match player and showed it once again against Williams on Saturday, denying the American a chance to equal the all-time record of 24 Grand Slam titles held by Margaret Court. Fissette has managed to coach five different players to victories over Williams and actually knows his own head-to-head against her. “5-all. I was 4-5 today and now it’s 5-all, it’s something I’m very proud of. The best player in the world, and with five different players now, my players have beaten her so it’s a great record,” he said with a smile. Kerber, a ruthless counter-puncher, has been adding more aggression to her game and Fissette believes she will continue to do more of that. “I’m still sure that we haven’t seen the best Angie yet,” insists the Belgian. When you’ve fought on a tennis court for six hours and 35 minutes, you can be forgiven for not being able to string together proper sentences. Kevin Anderson is perfectly capable of doing both though – surviving a gruelling marathon semi-final against John Isner that ended 26-24 in the fifth set, and eloquently articulating his feelings following said battle. After booking a spot in his maiden Wimbledon final by going through the longest-ever semi-final at SW19, the South African was mentally, physically and emotionally spent. Yet somehow his immediate words when he walked off court following his victory were dedicated to the man he just beat. “At the end, you feel like this is a draw between the two of us, but somebody has to win. John is such a great guy and I really feel for him because if I’d been on the opposite side I don’t know how you can take that, playing for so long and coming out short. I apologise if I’m not more excited right now just so many mixed emotions,” a choked up Anderson told the BBC. He then calmly explained how their match was yet another example of why the best-of-five format at Wimbledon, and two of the remaining three Slams, needs to be reexamined. Those are all extremely thoughtful statements after such an emotional and taxing experience. He gave us all a lesson in grace and humility. At 32, Anderson is enjoying the best 10-month stretch of his career. Hindered by injury woes, the Johannesburg-native saw his ranking slip to 80 in the world in January last year. Today, he is ranked No. 8 and has reached the finals at two of the last four Grand Slams. He’s made the second week at four of the last six. “He’s playing the tennis of his life,” said Novak Djokovic of Anderson ahead of their Sunday final. One of the tallest men in the top-100, Anderson’s work ethic and focus on fitness and recovery have allowed the Florida-based player, all 203cm of him, to insert himself among the best in the world. During his five-set victory over Roger Federer in the quarter-finals, Anderson was sprinting to the net and running down drop shots like someone half his size. The hours he must have put in off the court to get to that level of great movement must have been astounding. With many tall big-servers rising to the top, Anderson stands out as someone with a strong baseline game, smooth feel at the net, and a constant hunger to improve. He now faces Djokovic for a shot at a maiden Grand Slam trophy. The last time they faced off was in the Wimbledon fourth round where Anderson led by two sets before Djokovic came back to deny him the upset. Anderson has spent 21 hours on court through his six matches so far this fortnight. Djokovic has spent just 15 hours and 34 minutes in comparison. It’s a race against the clock when it comes to recovery for the South African, but if he manages to get his body ready for this match-up, he will give Djokovic a run for his money. 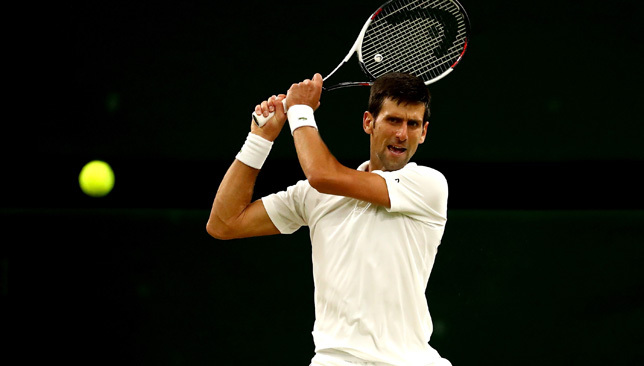 Novak Djokovic is one set away from a place in the Wimbledon final after edging ahead of Rafael Nadal in their belated semi. Djokovic took a third set tie-break before their match had to be suspended due to the All England Club’s 11pm curfew (2am UAE time), with the score 6-4 3-6 7-6 (11/9). The heavyweight duo, with five Wimbledon titles and 29 grand slams between them, did not start until 8.05pm (11:05 UAE time) due to the record-breaking match between Kevin Anderson and John Isner which preceded them. Anderson and Isner walked on to Centre Court at 1pm for a big-serving showdown which many thought might go the distance. It did, and then some. Six hours and 36 minutes later South African Anderson had beaten an exhausted Isner 7-6 (8/6) 6-7 (5-7) 6-7 (9/11) 6-4 26-24. It was the longest semi-final in grand slam history, and the second longest match ever at a major championship. Isner will not need reminding of the longest, having taken 11 hours and five minutes to beat Nicolas Mahut at Wimbledon in 2010, and this latest marathon reignited the debate about introducing fifth-set tie-breaks at all grand slams.